در پژوهش حاضر تأثیر منابع مالی داخلی بر بهره‌وری کل عوامل تولید بنگاه‌ها در چارچوب تئوری نمایندگی مورد بررسی قرار می‌گیرد. برای این منظور از داده‌های تابلویی 26 شرکت فعال در صنعت خودرو و ساخت قطعات بورس اوراق بهادار تهران طی دوره زمانی 1379-1392 استفاده شد. ابتدا با استفاده از روش لوینسون و پترین (2003) بهره‌وری کل عوامل تولید برآورد شده و سپس با استفاده از روش گشتاورهای تعمیم‌یافته (GMM) تأثیر جریان نقدی داخلی بر بهره‌وری کل عوامل تولید شرکت‌ها مورد آزمون قرار گرفت. نتایج به ‌دست آمده نشان می‌دهند که دسترسی به منابع مالی داخلی به‌ طور منفی و قویاً معنی‌دار بهره‌وری کل عوامل تولید صنعت خودرو را تحت تأثیر قرار می‌دهد. همچنین تأمین مالی از طریق ابزارهای بدهی تأثیر مثبت و درجه دوم بر بهره‌وری کل عوامل تولید صنعت خودرو داشته است. با عنایت به یافته‌های پژوهش، دلایل و شواهد تجربی حاکی از تأیید فرضیه تأثیر منفی جریان نقدی بر بهره‌وری به‌ دلیل وجود هزینه‌های نمایندگی می‌باشد. This paper by relying on the agency theory surveys the impacts of internal finance on firms’ productivity, using a panel of 26 Iranian firms in automotive industry over the period 2000-2014. We first obtained a measure of firm-level TFP, using the Levinsohn and Petrin (2003) method and then by GMM estimators, the effects of internal finance on TFP analyzed. We find that the availability of internal finance has negative and significant effect and debt finance has positive and quadratic effect on firms’ TFP. So, these results prove the hypothesis that cash flows have negative impact on TFP because of agency costs. ابزری، مهدی؛ دستگیر، محسن؛ قلی‌پور، علی؛ «بررسی و تجزیه و تحلیل روش‌های تأمین مالی شرکت‌های پذیرفته شده در بورس اوراق بهادار تهران»، فصلنامه بررسی‌های اقتصادی، 1386، شماره 4. زراءنژاد، منصور؛ انصاری، الهه؛ «اندازه‌گیری بهره‌وری سرمایه در صنایع بزرگ استان خوزستان»، فصلنامه بررسی‌های اقتصادی (اقتصاد مقداری)، 1386، شماره 4. مهرآرا، محسن؛ رضایی، عباسعلی؛ «کیفیت نهادها و آثار آزادسازی تجاری در کشورهای در حال توسعه منتخب»، فصلنامه پژوهش‌نامه بازرگانی، 1389، شماره 56. Aghion, P., Angeletos, G., Banerjee, A., & Manova, K; 2010, "Volatility and growth: Credit constraints and the composition of investment", Journal of Monetary Economics, No. 57. Arellano, M. & Bond, S; 1991, "Some tests of specification for panel data: Monte Carlo evidence and an application to employment equations", Review of Economic Studies, No. 58. Aw, B. Y., Roberts, M. J., & Xu, D. Y; 2008, "R&D investment, exporting and the evolution of firm productivity", The American Economic Review, No. 98. Ayyagari, M., Demirgüç-Kunt, A., & Maksimovic, V; 2010, "Formal versus Informal Finance: Evidence from China", Review of Financial Studies, No. 23. Benito, A. & Hernando, I; 2007, "Firm behavior and financial pressure: Evidence from Spanish panel data", Bulletin of Economic Research, No. 59. Biesebroeck, J. V; 2008, "The Sensitivity of Productivity Estimates: Revisiting Three Important Productivity Debates", Journal of Business and Economic Statistics, No. 26(3). Blundell, R., & Bond, Steven; 1998, "Initial conditions and moment restrictions in dynamic panel data models", Journal of Econometrics, No. 87. Carpenter, R. E., Fazzari, S. M., & Petersen, B. C; 1994, "Inventory investment, internal-finance fluctuations and the Business-cycle", Brookings Papers on Economic Activity, No. 2. Carpenter, R. E., Fazzari, S. M., & Petersen, B. C; 1998, "Financing constraints and inventory investment: A comparative study with high-frequency panel data", Review of Economics and Statistics, No. 80. Carpenter, R. E., & Petersen, B. C; 2002, Is the growth of small firms constrained by internal finance?, The Review of Economics and Statistics, No. 84(2). Chen, M., & Guariglia, A; 2013, Internal financial constraints and firm productivity in China: Do liquidity and export behavior make a difference?, Journal of Comparative Economics, No. 41(4). Coricelli, F., Driffield, N., Pal, S., & Roland, I; 2012, "When does leverage hurt productivity growth? A firm-level analysis", Journal of International Money and Finance, No. 31. Demsetz, H. & Villalonga, B; 2001, "Ownership structure and corporate performance", Journal of Corporate Finance, No. 7. Ding, S., Guariglia, A. & Knight, J; 2013, "Investment and financial constraints in China: does working capital management make a difference? ", Journal of Banking and Finance, No. 37. Fazzari, S. M., Hubbard, R. G., & Petersen, B. C; 1988, "Financing constraints and corporate investment", Brookings Papers on Economic Activity, No. 1. Fosu, S; 2013, "Capital structure, product market competition and performance: Evidence from South Africa", The Quarterly Review of Economics and Finance (In Press). Gatti, R. & Love, I; 2008, "Does access to credit improve productivity? Evidence from Bulgaria", Economics of Transition, No. 16. Girma, S., & Vencappa, D; 2014, "Financing sources and firm level productivity growth: Evidence from Indian manufacturing", Journal of Productivity Analysis, doi: 10.1007/s11123-014-0418-7. Jang, S., Tang, C., & Chen, M; 2008, "Financing behaviors of hotel companies", International Journal of Hospitality Management, No. 27. Jensen, M.C; 1986, "Agency costs of free cash fow, corporate fnance and takeovers", American Economic Review, Papers and Proceedings, No. 76. Jensen, M. C. & Meckling, W. H; 1976, "Theory of the firm: managerial behavior, agency costs and ownership structure", Journal of Financial Economics, No. 3. King, R. G., & Levine, R; 1993, "Finance, entrepreneurship and growth: Theory and evidence", Journal of Monetary Economics, No. 32. Levine, R., & Zervos, S; 1998, Stock markets, banks and economic growth, American Economic Review, No. 88(3). Levinsohn, J. & Petrin, A; 2003, "Estimating production functions using inputs to control unobservables", Review of Economic Studies, No. 70. Mallick, S. & Yang, Y; 2011, "Sources of financing, profitability and productivity: First evidence from Matched firms", Journal of Financial Markets, Institutions & Instruments, No. 20(5). Margaritis, D., & Psillaki, M; 2010, "Capital structure, equity ownership and firm performance", Journal of Banking & Finance, No. 34. Marschak, J. & W. H. Andrews; 1944, "Random Simultaneous Equations and the Theory of Production", Econometrica, No. 12 (3, 4). Melitz, M. J; 2003, "The impact of intra-industry reallocations and aggregate industry productivity", Econometrica, No. 71. Modigliani, F., & Miller, M. H; 1958, "The cost of capital, corporate finance and the theory of investment", American Economic Review, No. 48. Modigliani, F., & Miller, M; 1963, "Corporate income taxes and the cost of capital: A correction", The American Economic Review, No. 5. Moreno-Badia, M. & Slootmaekers, V; 2009, "The Missing Link between Financial Constraints and Productivity", Working Paper WP/09/72, International Monetary Fund, Washington, DC. Myers, S. C; 2001, "Capital structure", Journal of Economic Perspective, No. 15(2). Myers, S. C., & Majluf, N. S; 1984, "Corporate financing and investment decisions when firms have information that investors do not have", Journal of Financial Economics, No. 13. Nickell, S., & Nicolitsas, D; 1999, "How does financial pressure affect firms? ", European Economic Review, No. 43. Nucci, F., Pozzolo, A. F. & Schivardi, F; 2005, Is firm’s productivity related to its financial structure? 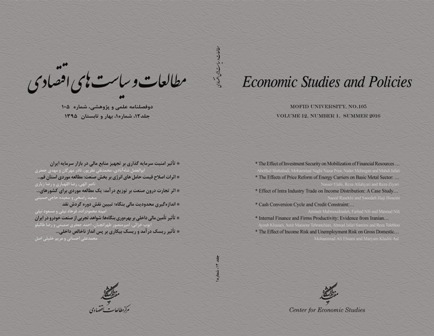 Evidence from microeconomic data, Rivista di Politica Economica I-II. Nunes, P. M., Sequeira, T. N. & Serrasqueiro, Z; 2007, "Firms’ leverage and labor productivity: a quantile approach in Portuguese firms", Applied Economics, No. 39. Olley, S. & Pakes, A; 1996, The dynamics of productivity in the telecommunications equipment industry. Econometrica, No. 64. Pakes, A; 1996, "Dynamic Structural Models, Problems and Prospects: Mixed Continuous Discrete Controls and Market Interaction", in C. Sims (ed.) Advances in Econometrics, Sixth World Congress, 2 Cambridge University Press. Palangkaraya, A., Stierwald, A. & Yong, J; 2009, "Is firm productivity related to size and age? The case of large Australian firms", Journal of Industry, Competition and Trade, No. 9. Park, k., & Jang, S. C; 2013, "Capital structure, free cash flow, diversification and firm performannce: A holistic analysis", International Journal of Hospitality Management, No. 33. Pavcnik, N; 2002, Trade Liberalization, Exit and Productivity Improvements: Evidence from Chilean Plants, Review of Economic Studies, No. 69(1). Petrin, A.; Poi, P. & Levinson, J; 2004, "Production function estimation in Stata using inputs to control for unobservables", The Stata Journal, No. 4(2). Rajan, R., & Zingales, L; 1995, "What do we know about capital structure? Some evidence from international data", Journal of Finance, No. 50. Shleifer, A. & Vishny, R. W; 1989, "Management entrenchment: The case of manager-specific investments", Journal of Financial Economics, No. 25. Tang, C., & Jang, S; 2007, "Revisit to the determinants of capital structure: a comparison between lodging firms and software firms", International Journal of Hospitality Management, No. 26 (1). Van Biesebroeck, J; 2005, "Exporting raise productivity in sub-Saharan African manufacturing firms", Journal of International Economics, No. 67.